Corporate Event Keynote to energize and inspire! Boris presents to top names in corporate, private at public sector events for almost four decades. He is an accomplished comedian with a hilarious presentation that entices self-improvement. Boris is in high demand to deliver the precise vision of meeting planners and brings a wealth of knowledge and experience to make booking easy. Boris has an astoundingly high re-booking rate and performs repeatedly at multiple events for the same company. Boris is a two-time TEDx speaker and regularly appears on television and alongside some of the most enigmatic world leaders and presenters. He has coached celebrities, royalty, sports and political figures. Hire a multiple award-winning speaker with a fun interactive presentation that delivers the message loud and clear. Boris shares personal examples of setbacks and tremendous leaps of faith that keeps audiences engaged and on the edge of their seats. He explains the important ways to understand how negative thoughts form and how to prevent them from returning in the future. Attendees receive useful ideas, strategies and steps to help reach goals while being entertained and amazed. Procrastination - why leave it till later? Boris has a simple objective of transforming lives for the better. He guides participants to think outside the box and be a leader who can deal effectively with change. Every presentation is designed to excite the thinking process to derive untapped options, entertain and engage. Boris is the reason individuals are driven to success, impacting priductivity and bottom line. Boris has an extensive knowledge of psychology, computer programming and hypnosis. He combines this knowledge to blend motivation with entertainment. He is a certified hypnotherapist and holds memberships in numerous professional guilds. He is a regular guest expert on Maury, helping eliminate phobias. His work has been seen on The Robert Irvine Show, The Comedy Channel, Montel, Howie Mandel Show, The Vegas Show among many others. He travels internationally appearing in diverse venues. Captivating and Entertaining WOW Factor! Boris is an engaging motivational speaker and exciting event entertainer. He draws from a vast knowledge to empower his audience. His keynote address presents ideas that astound and captivate, while elaborately demonstrating improvement skills. They call him The Incredible Boris for a reason. Hire a motivational speaker that brings excitement and is talked about for years to come. Motivate your company or organization. He invites people from the audience to participate in an experience that is motivational and team building. Transform your team to deliver goals and exceed expectations. Boris demonstrates his points verbally and visually. Attendees lose their inhibitions and limiting behavior by being exposed to a powerful presentation. Humor plays a vital role to provide enjoyment and laughter for meetings, conferences and conventions. A fantastic way to take attendees from work mode and serious atmosphere to energize them, engage and regain interest. The result is laughter and energy that carries into the next session or a final keynote speaker that gets people ineracting. Boris engages conference audiences with a great sense of humour, while providing useful skills to professional interactions that can be used immediately to improve communication, engage clients and conference attendees. Boris explains how to achieve a constant positive attitude and state of mind. He teaches the tricks of how to control your life instead of the life taking control of you. At the end of the motivational presentation you have a smile on your face and skills to keep it there. Programs that fit YOUR team needs! 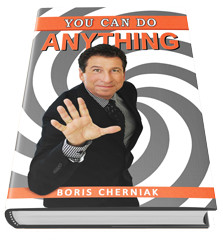 Boris understands organizations have specific speaker needs and provides customized motivational programs. He will discuss with company executives and committee members speech topics and material covered in the presentation. Have your team benefit from a presentation that changes lives. Contact our office to have Boris speak at your conference, meeting or convention. Keynote Speech and Entertainment presented worldwide. Books and CDs available for attendees to complement the keynote and re-inforce the powerful message. Workshop / Breakout session to discuss body language and psychology of a positive mindset.